What It’s About: The tale of Mr. Fox (George Clooney) and his escalating conflict with three horrible farmers, Boggis, Bunce and Bean. Bean (Michael Gambon) is the worst of the lot, spurring the others to take extreme measures against Mr. Fox, eventually starving animals over the entire area. Mr. Fox and the others fight to stay one step ahead of the farmers, but ultimately the conflict is quite ruinous to both sides. Mr. Fox’s son Ash (Jason Schwartzman) is having a hard time living up to his father’s dashing style and prowess, which is made worse when his better looking, more athletic, less weird cousin Kristofferson (Eric Chase Anderson) comes to live with them. 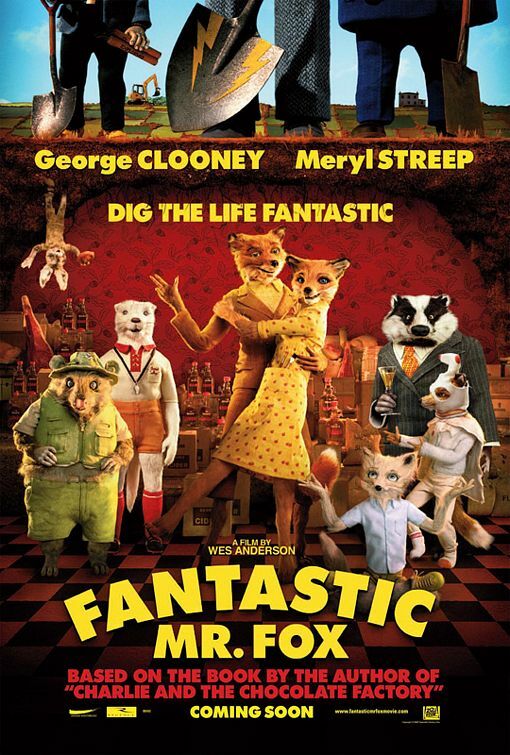 Mrs. Fox (Meryl Streep) and Mr. Fox have to come to terms with his decision to break his promise to stop being a thief. Why Watch it Today? : George Clooney, whose charm and style comes through even when he’s doing voice work for an animated film, turns 53 today. Wes Anderson brings his own personal style to his adaptation of Roald Dahl’s book. This entry was posted in Adaptation, Animation, Arthouse, Based on a Book, Comedy, Crime, Family, Fantasy, Heist, Movie of the Day, Stop Motion Animation and tagged 20th Century Fox, Adrien Brody, anthropomorphic animals, badger, Best Animated Film Nominee, Best Original Score Nominee, Bill Murray, Brian Cox, chicken thief, farm, farmers, father, father-son relationship, fox, George Clooney, heist, Jason Schwartzman, Karen Duffy, Mario Batali, Meryl Streep, Michael Gambon, mother, mother-son relationship, Noah Bambauch, Owen Wilson, Roald Dahl, Roman Coppola, ski mask, supermarket, talking animals, thief, weasel, Wes Anderson, Wilem Defoe.